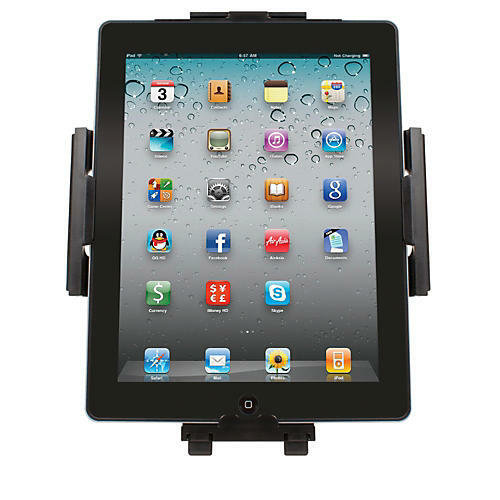 Ultimate Support's HyperPad mini is the industry's first 5-in-1 stand for the iPad mini! Whether you're using your iPad mini at home, at work, while singing at the coffee shop, out gigging with your guitar or keyboard, or laying down beats at the club, HyperPad mini has you covered. Whether you're listening to music, watching a movie, checking email, or investigating today's weather, HyperPad mini is the iPad mini stand you've been waiting for. Fully capable of securely holding your iPad mini in both landscape and portrait view (and at varying angles), the HyperPad mini secures your iPad mini on all four sides. The handy kickback support leg rotates and angles so you're free to adjust it to any arrangement you need. Keeping lyrics, set lists, charts, and other important information readily available to you while on stage is a musician's dream come true. In today's digital world you can finally retire all your gigging binders, folders, napkins, and notebooks. Keeping it within arms reach, the HyperPad mini includes a mic stand pole clamp that securely attaches to poles from .8" to 1.25". We've included an adjustable gooseneck attachment for further personalized positioning! Sometimes, you simply want a secure way to position your iPad mini on a table. So, whether it's your studio desk, DJ coffin, or the kitchen table, the included desktop clamp and gooseneck arm mounts to any flat surface from .5" to 1.6" in thickness providing a flexible, secure mounting option for your iPad mini. In addition to clamping the HyperPad mini to the pole of your mic stand, the HyperPad mini can be mounted to the top of a microphone stand (5/8" thread) with the included gooseneck arm! So, if you want to make great use of that extra mic stand you have laying around in the garage, or simply prefer vertical access to your iPad mini, the Ultimate Support HyperPad mini delivers! Includes a Mic Stand Pole Clamp and gooseneck extension for use on poles ranging in size from .375" to 1.25"
Also includes a Desktop Clamp so you can secure your iPad mini to the overhang of flat surfaces ranging in size from .5" to 2"